How often we hear that saying “How time flies!” For those of us who do recall Exeter back in 1984 we may remember it for the fact that the world did not end and secondly for the appearance on the city’s streets of The Minibus! In fact most of us have forgotten all about the era of the Minibus, the name Devon General has been all but consigned to history and when we think of Exeter buses many of us are too young to remember the Corporation owned fleet, so when we think buses we think “Stagecoach”. 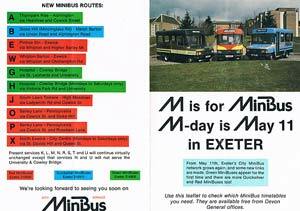 However, we should give credit where credit is due and remember that in Public Transport spheres Exeter was very much in the public eye back in 1984 and one name crops up almost in the same mouthful as Minibuses - Harry Blundred. 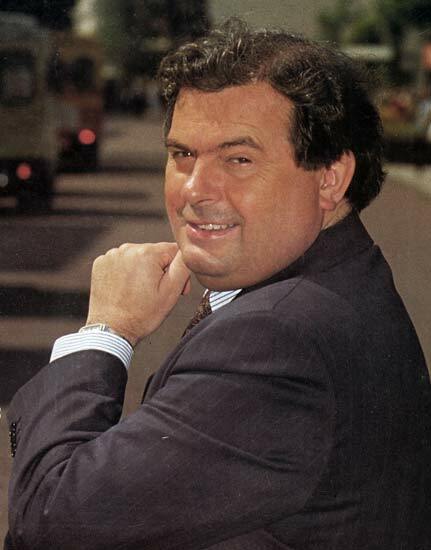 Harry Blundred, Conservative, Thatcherite, Vegetarian, a graduate in Modern Languages and born in Stoke on Trent. One time Conductor with Potteries Motor Traction, he progressed via East Midland Motor Services, Southdown Motor Services, City of Oxford Motor Services and thence to Devon General on the 1st January 1983 as General Manager. His first venture in Exeter was with ten 16 seaters – not any 16 seater – the Ford Transit, which he described as ‘magic’. 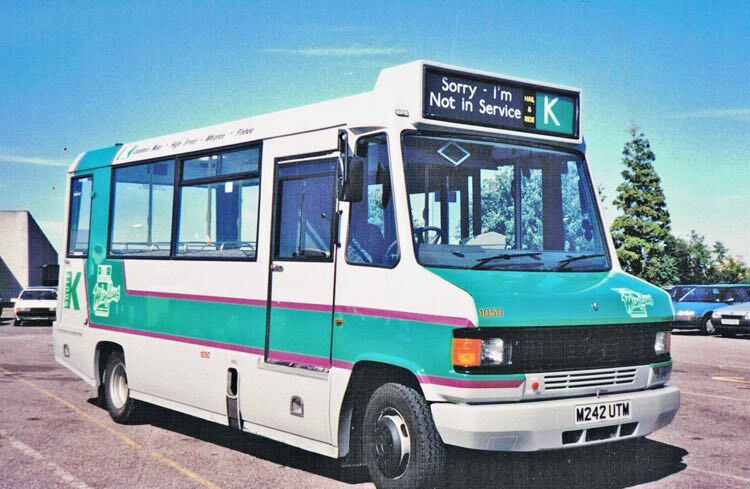 These were put on the existing Pinhoe to St Thomas service and commenced operations on the 27th February 1984 at 5 minute intervals in daytime, 10/15 minute in the evenings and Sundays; within 3 weeks the service was leaving people behind. Advertising Billboards at bus shelters proclaimed “ What’s Red and Yellow and won’t be Long?” Vehicles were in radio contact by means of the “Air Call” radio system with the Control Centre, under the management of Mr Stuart Scott. 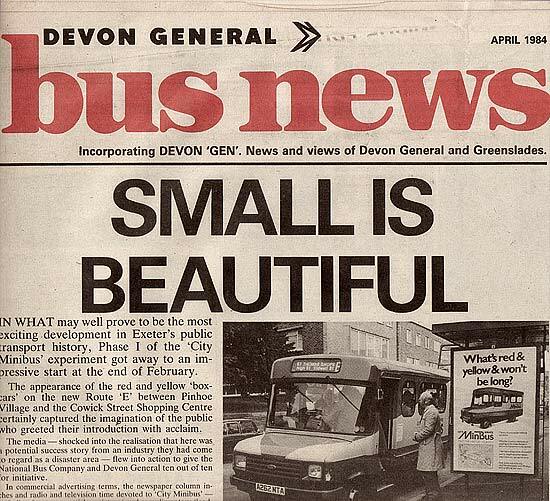 With intense publicity in the press and on commercial radio and television patronage grew and grew – enhanced by the fare structure (only 10p from Ferndale Road to the City Centre is an example), and the high frequency of service, this initial success continued and as a result Exeter’s minibus fleet expanded. The initial Red (and Yellow) Transits were followed by the Quicksilver (Blue and Silver) and were supplemented on the 11th May by the Green Fleet (Green & Gold) which were allocated to the A, G & H services. The Blue operated the B service and the E, W, J, O, P and X service by the Red Fleet. L Countess Weir - Topsham Rd. – City Centre – Polsloe Br. – Harrington Lane. 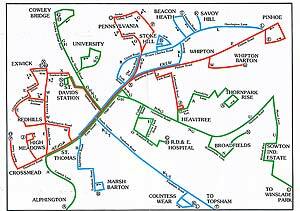 In October 1988 there were more changes and some services were shortened or re – routed. New services include Pinhoe to Buddle Lane (Saville Road. ), St Thomas, and an extension of the Alphington route to cover Smithfield Road. & Ide Lane. The Matford Park & Ride was tweaked to serve more of Marsh Barton Estate; more buses for High Meadows; Alphington & Thornpark Rise; Broadway & Cowick Street; Union Road & Stoke Hill; Warwick Way, Hillyfield Rd. and Whipton Village. There were other jiggling to the Pinhoe services and generally extra buses were to be deployed not only at rush hours but also during off peak times. There were by now a total of 16 lettered routes – including the Matford Park & Ride. You could buy a whole host of the Company’s Tickets at most Local Post Offices and an Exeter Freedom Ticket (7 days unlimited travel within the City) cost £5.50. 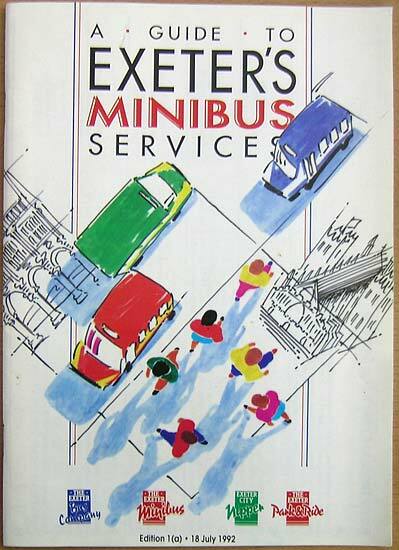 By March 1990 Exeter was to have “A Comprehensive Minibus Network” and the emphatic statement described this revamped system with the logo:- “Nobody Does It Better”. 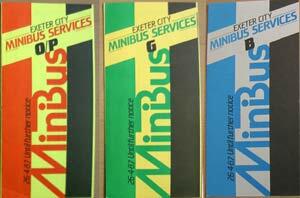 By this time the three fleets were known as “The Exeter Minibus” (Red Fleet), “Exeter City Nipper” (Green Fleet), “The Exeter Bus Company” (Blue Fleet). There were now 19 lettered services (two letter “V”), but no “O” or “D” or “W”. An Exeter Freedom Ticket giving Unlimited Travel within Exeter City for 7 Days was still good value at £7. 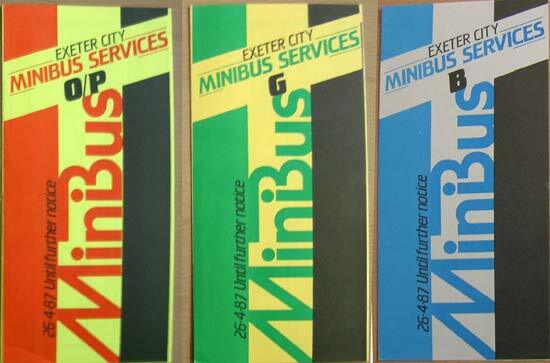 You could buy a 12 journey ticket for the cost of only 9 and as in the early days Travel Info Hotlines were available to each of the three Minibus Fleets. 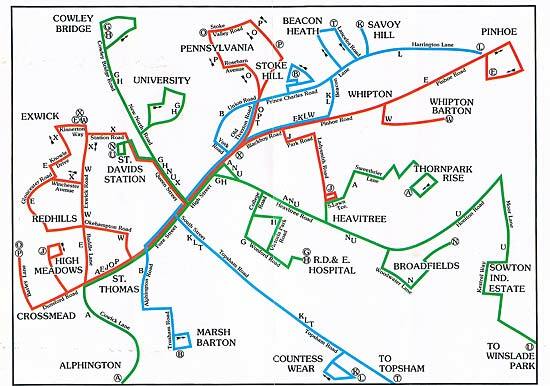 By June 1993 Devon General were part Harry’s Transit Holdings Empire – this included, in addition to Devon General, Bayline, Docklands Transit, Red & Blue Admiral (Portsmouth), Thames Transit . The Transit Holdings In House Magazine – named (surprise surprise!) “In Transit” remarks on two of Exeter’s Ford Transits which were loaned to the Exeter University Drama Department and ended up on a Grand Tour of Europe loaded up with 24 actors, luggage, props and scenery; meanwhile back in Exeter a redundant Transit Minibus was donated by the Company to the Matford Lodge Unit and was presented to the Chairman of the Exeter & District Community Healthcare Trust, Sylvia Russell, by John Lacey. It had been given a green and white repaint courtesy of Marsh Barton Coachworks. 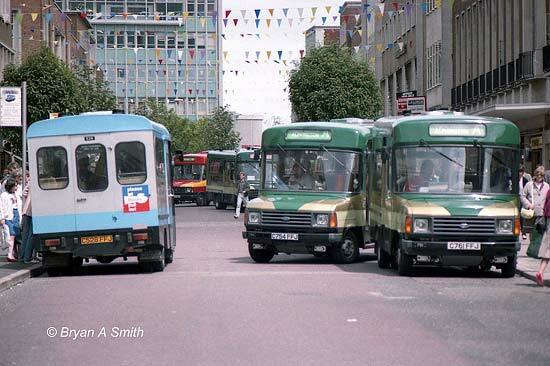 Quite when Minibuses disappeared from our City’s streets is almost impossible to say – the original Transits gave way to larger vehicles – and larger vehicles – and larger vehicles! Frequencies reduced and reduced and reduced and fares went up and up and up! “I, too, knew Harry Blundred, and worked with him on a number of his projects. 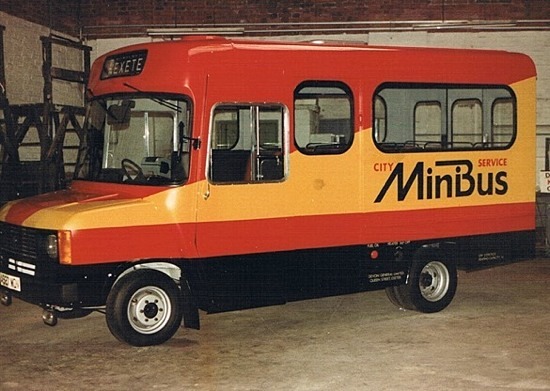 The secret behind the minibuses (that he alone identified) was that the drivers would make or break the product. So the first minibus drivers - in Exeter - were all recruited from local shops and supermarkets. They had done all the customer training that the bus industry had ignored at its cost. Teaching them to drive an oversized car was no great problem. They were cheaper to employ than conventional drivers - but even so their minibus driver's wage was a lot more than the supermarkets were paying. His minibuses became early smoke-free zones, courtesy of the new drivers. It led to rows between the minibus crews and the established drivers who were eventually allowed onto the buses. The mini drivers objected to the smoking which went on surreptitiously, just as they had in conventional buses, and it eventually led to some sackings. Where is he now – I don’t know – probably with his feet up in Monte Carlo with a cool drink in one hand and a veggieburger in the other – it’s possible. If he, or any of his family read this I shall be pleased – I did know and meet him back in the days when I operated buses in East Devon (big ones!) and he graced my Inaugural Run on the Exeter City Sightseeing Tour – in fact he can be seen getting off at the Quay in the Video Inaugural Red Bus Run. The First and Original Exeter Minibus survives, in preservation believe it or not! – as do many others but no longer serve the public along our City streets. We’ve moved on. A last word - in April 1987 the Express & Echo captioned an article “Vanishing Breed: The Double Decker” – twenty five years later they’re back, alive and well! Route map for the new services Leaflets for the three services Test livery for the first minibus. Courtesy Brian Allen. The larger second generation minibus.